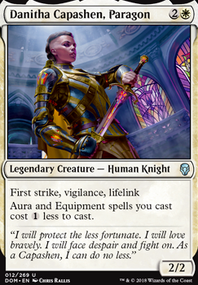 Daybreak Coronet , Hero of Iroas , Sram, Senior Edificer , Swords to Plowshares , Darksteel Mutation , and Faith's Fetters . Your deck could use more removal, cards draw, and less shroud effects, more hexproof. AdNauseam12 on Aura aura aura! This is a good collection of cards! 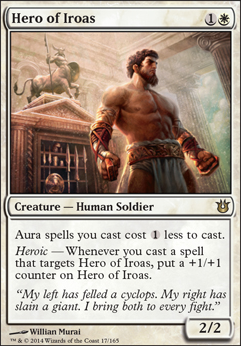 If I were you, I would either go for a more midrange deck built around non-auras like Sigil of the Empty Throne and Sphere of Safety or focus on a more aggressive aura-based deck that is built around Hero of Iroas and other heroic creatures. If you take the latter option, you can curve from Favored Hoplite or Lagonna-Band Trailblazer into Phalanx Leader and Blessed Spirits. Then start targeting Phalanx Leader with cheap auras and Blessed Spirits will get huge fast. If you go this route you need protection since creatures with auras have a huge target on them. You already have Emerge Unscathed, which is great, but you might also consider Gods Willing, Center Soul, or an umbra like Hyena Umbra. Those are a lot cheaper to cast than Spectra Ward and, unlike Selfless Spirit, they'll re-trigger the heroic mechanic. While I definitely see the enchantment synergy, having curses like Torment of Scarabs that deny your opponents resources and cards like Master of the Feast that give your opponents resources seems non-synergistic. I'd try to focus either on the curse plan or the Fate Unraveler plan to maximize your interactions. 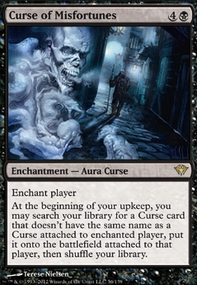 White is a really useful color for a curse deck and is likely to be more effective than blue without more mill cards. It gives you access to the incredibly strong Overwhelming Splendor and occasionally useful Curse of Exhaustion. You can also play Hero of Iroas, Kor Spiritdancer, Sram, Senior Edificer, or Mesa Enchantress instead of Cloud Key. Bitterheart Witch is one way to get a Curse of Misfortunes into play to start the engine, although Heliod's Pilgrim is another possibility. For a "draw to death" strategy, Unraveler can be supplemented by Underworld Dreams. If you go red, you could use Fevered Visions and Kederekt Parasite instead. This strategy benefits from symmetrical draw effects like Dictate of Kruphix and Howling Mine, or forced draw as you have with Master of the Feast. Having plenty of removal and/or hand disruption is important since your opponents will have more gas to work with. If the chip damage isn't getting the job done, Notion Thief is another great way to break the symmetry. The group I play with, I'm frequently going against mill decks and having a little card count advantage is generally a positive thing. Also, after quite a few test games I found that the card draw from Kor Spiritdancer and Sage's Reverie allow me to dig quite deep into the library, especially with the number of one and two-mana creature enchantments, not to mention Hero of Iroas further bringing out the number of enchantments I can have in play (His cost reduction affects Bestow costs as well). Going to 70 cards was a kind of middle-ground for utilizing these abilities while playing in quite a few mill games, though this is just my initial attempt and I'm more than open to suggestions. What would you remove (or rebuild) to drop it down to 60 cards? A: this isn't very competitive. B: You might want to give Hero of Iroas a spin in place of Herald. If I have 3 Hero of Iroas in play and have a spell that targets one of them, do all 3 get the +1/+1? All the creatures in the deck are designed to buff the board or control my opponents Hero of Iroas only makes my commander one cheaper and it's heroic trigger will never get hot on this deck, similar to Anax and Cymede so I don't think they're strong enough to put in. I've been trying to avoid double red cost cards as I'm still refining the mana base so that the red is just a splash. 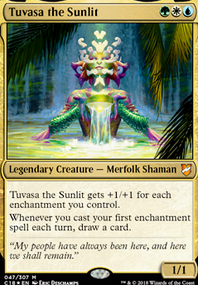 I've also been trying to lower the cmc from the original deck so whilst Sigil of the Empty Throne is powerful i'm trying to avoid > 5 cost cards that trigger later in the game so the deck runs faster than it did before as that was the biggest problem pre-revamp. Thanks for the suggestions though.